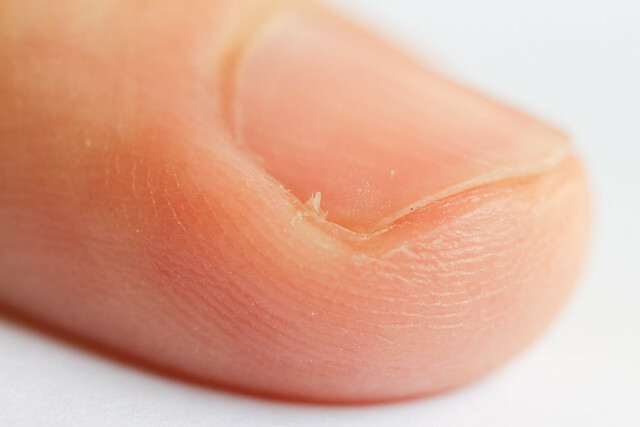 A hangnail is a small piece of skin that separates from the side of the cuticle, creating a tiny tear. Contrary to its name, a hangnail does not affect the actual nail at all. Rather, hangnails are tears in the skin that are caused by several common scenarios, making them a regular occurrence for the majority of individuals. Dry skin is the biggest culprit for hangnails, says Dr. Joel Schlessinger. Cold winter weather can dry out skin, as can harsh chemicals, such as household cleaners, and frequent hand washing. Another common cause is nail biting. Biting at nails can damage the skin underneath the nail bed or actual fingernail and lead to hangnails. Lastly, manicures can lead to hangnails, particularly if cuticles are clipped, a practice dermatologists strongly discourage. Nail clipping with an unsteady hand, whether performed at home or by a nail technician, can lead to nicks, which may split into hangnails. Dr. Joel Schlessinger shares hangnail care tips. Hangnails aren’t dangerous and most aren’t painful. However, if not properly cared for, they can become infected with bacteria, yeast and fungi and grow red and swollen. Treat hangnails early, before they become irritated. Start by soaking your finger or fingers in warm water for a few moments. This will help soften the hangnail and stop the tearing. Next, use a clean nail clipper or nail scissors, like Tweezerman Rockhard Cuticle Nipper ½ Jaw, to gently nip off the skin. To finish, massage a little moisturizer or hand cream into the nail bed. With a formula like NIA24 Sun Damage Repair for Decolletage and Hands, you can treat dark spots, fine lines and other signs of aging, all while preventing hangnails. For an intensely hydrating formula, you might like Epionce Medical Barrier Cream. If the area around a hangnail has grown red and swollen, you likely have an infection. If this is the case, you can follow the above steps, then apply an anti-bacterial ointment and cover the area with a bandage. The infection should heal in one to three days. Be sure to change the bandage twice a day and reapply ointment if needed. To minimize minor irritation, pick up FixMySkin Healing Body Balm Unscented with 1% Hydrocortisone. This convenient balm stick contains soothing shea and cocoa butters, plus 1% hydrocortisone, to heal damaged cells. Dr. Joel Schlessinger shares tips for preventing hangnails. The easiest way to prevent hangnails is to keep your hands moisturized. If you’re especially prone to them, you may want to apply a hand cream or lotion two to three times a day. FixMySkin is perfect for moisturizing skin on the go. You can also use a little cuticle oil a few times a week if needed. We like Qtica Solid Gold Cuticle Oil Gel, a nourishing 12-oil blend. If you tend to pick or bite at your nails, it’s time to kick the habit once and for all. Not only will you save yourself the headache of regular hangnails, you’ll also lower your risk of contracting warts and infections, plus communicable illnesses, like the cold and the flu. When caring for nails at home, be sure not to clip your cuticles. Cut your nails straight across and gently file the edges for a rounded corner. When opting for a professional manicure, choose a clean, reputable salon and be sure that tools are sterilized between uses. Do you have a question for Dr. Schlessinger about hangnails? Let us know in the comments section. Ichthyosis is a condition characterized by dry, scaly accumulations of skin cells. This condition is usually inherited and is most common in babies. Though it typically disappears during early childhood, adults may develop ichthyosis under certain circumstances. In this blog post, Joel Schlessinger MD explains the causes, symptoms and treatments for this skin condition. Dr. Joel Schlessinger explains ichthyosis. Ichthyosis slows your skin’s natural shedding process, causing an excessive buildup of protein in the upper layer of skin. Dry skin accumulates in patches on the surface and result in a scaly, rough texture. Ichthyosis is most often an inherited condition that typically appears at birth or during the first few years of life. In most cases, the condition disappears during early childhood but for some ichthyosis may return during adulthood. Ichthyosis that is not inherited from one or both of your parents may be associated with another condition such as an underactive thyroid, kidney disease, lymphoma or HIV infection. The symptoms of ichthyosis include flaky, scaly skin that appears white, gray or brown. 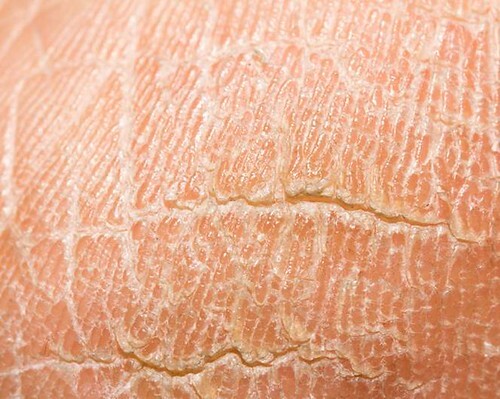 The condition may also cause deep, painful cracks in the skin that are worsened in cold or dry environments. Mild cases of ichthyosis are confined to specific areas such as the elbows, legs or shins. More severe cases cover larger areas of the body such as the back, abdomen, arms or legs. There is no cure for ichthyosis, says Dr. Joel Schlessinger. Ichthyosis has no cure but you can control the symptoms with continued treatment. Because the condition causes dry skin, it is important to moisturize the affected areas regularly, especially after bathing or swimming, to restore lost moisture. Choose a product formulated to provide long-lasting hydration such as EltaMD Intense Moisturizer. This hydrating cream nourishes while relieving the uncomfortable effects of ichthyosis. FixMySkin Healing Body Balm hydrates with shea butter and cocoa butter to improve dryness. This formula contains 1% hydrocortisone, a topical steroid that soothes inflammation and irritation, to reduce the irritating symptoms of ichthyosis. To rid your skin of the dead cells that accumulate due to ichthyosis, exfoliate the affected areas with a product that contains alpha hydroxy acids or polyhydroxy acids. NeoStrata Problem Dry Skin Cream moisturizes dry areas while exfoliating with glycolic, lactic and mandelic acids. These ingredients gently sweep away debris to reduce cell accumulation and help achieve a smoother skin texture without causing irritation. NeoStrata Bionic Lotion employs lactobionic acid to remove dry, flaky skin without aggravating ichthyosis. It also contains nourishing vitamin E and soothing meadowfoam seed oil to improve skin health and comfort. In addition to regularly moisturizing and exfoliating, there are further measures to help comfort your skin. Avoid products that are harsh or drying. If you must use chemicals or products that dry your skin, wear gloves or other protective clothing to reduce skin’s exposure to the irritant. It may also be beneficial to use a humidifier, particularly if you live in a cold or dry climate. This will add moisture to the air around you to help your skin retain its natural hydration levels. If the symptoms of ichthyosis are present, see a board-certified dermatologist. If you expect a loved one may have ichthyosis, it is best to consult a board-certified dermatologist who can provide an individualized course of treatment. If the condition is not inherited, it may be symptomatic of an underactive thyroid, kidney disease, lymphoma or HIV infection. Your physician can pinpoint the cause of ichthyosis and help you proceed with the appropriate treatment. Do you have questions about ichthyosis? Ask Dr. Schlessinger in the comment section. Returning to school is an exciting chance to start over and enjoy new opportunities. With September upon us, your children are probably just settling into a routine and re-learning to balance homework, activities and friends. Along with all the excitement, though, comes a packed schedule and significant exposure to germs. With so much to do, it can be easy to let hygiene practices fall by the wayside. As a parent, it’s important to let your children know that the key to being healthy, happy and productive this school year is to take great care of themselves and their belongings. Share the following tips with your children to help them have their best year yet. Teaching your children proper sun safety habits will set them up for a lifetime of healthy skin. Apply sunscreen to all exposed areas at least 15 minutes before leaving the house each morning, rain or shine. It’s also important to be consistent with weekend outings, sports practices and playdates. Teach your child how to apply sunscreen so that they understand how to get a full, even application and be sure they know when to reapply. We like EltaMD UV Sport Water-Resistant Broad Spectrum SPF 50, a formula that is great for wearing while active outdoors since it doesn’t run and won’t string if it should get in eyes. Skin may begin burning and sustaining damage in as little as 10 minutes of intense sun exposure, which may mean your child will need to reapply during the school day for outdoor gym classes, recesses and field trips. You’ll want to store an extra sunscreen in your child’s school bag and sports bag just in case. Find out your school’s rules about sunscreen, says Dr. Joel Schlessinger. It’s important to note that sunscreen has been banned in some school districts across the United States because it is considered a drug. While sunscreen is not dangerous, school officials have expressed concerns over eye irritation and potential allergic reactions for students. Check with your child’s school about their sunscreen policy. Some may require a doctor’s note. If sunscreen is banned from your child’s school completely, no exceptions, you’ll want to contact administration about a change in policy or even consider exploring other districts. Two or more blistering sunburns sustained during childhood can increase the risk of skin cancer up to ten times later in life, so this is not an issue to be taken lightly. Acne can be embarrassing for adolescents and leave them feeling socially isolated. Severe types of acne, such as cystic acne, can even leave behind permanent scarring that is next to impossible to completely eliminate down the road. It’s best to seek treatment for acne early, when your children are just beginning to experience breakouts. Your dermatologist should be able to prescribe an appropriate acne regimen and help teach your children how to use the products. Those adolescents who struggle with acne should be sure to avoid milk and other dairy products, as these can worsen breakouts. Dr. Joel Schlessinger recommends a mild facial cleanser twice daily for children. Even if your child has not experienced his or her first pimple, it’s best to encourage them to wash their face twice daily, once in the morning and once in the evening. Once they’ve reached nine or ten, breakouts could be just around the corner. A mild cleanser, like LovelySkin LUXE Clarifying Gel Cleanser, can help heal and prevent breakouts. It contains 2% salicylic acid and 2% glycolic acid to gently exfoliate skin and remove impurities. Sharing personal items can lead to the spread of viruses, bacteria and fungus and result in serious illness. Even refraining from sharing items like school supplies can cut down on the spread of germs, but there are certain items that shouldn’t be shared under any circumstances. These include clothing items such as hats, coats and shoes, lip balms, deodorants, nail clippers, towels, toothbrushes, makeup and earphones. Sharing drinking glasses, straws and eating utensils should also be avoided. Encourage regular hand washing, especially after using the restroom and before eating each meal. Remind children to keep pencils, toys and drinking fountain bubblers away from their mouths. Laundry hygiene is a big part of stopping the spread of germs, as well as various skin irritations. Items that come into close contact with the body are most likely to carry bacteria. Change towels and washcloths daily if possible, and launder bedding at least once a week. This will help cut down on acne and other skin infections. Be sure your child wears cleans clothes each day, and don’t forget about gym and sports uniforms. Lockers often have poor ventilation and can be breeding grounds for mold and mildew. Teach your child to hang his or her coat and gym clothes, and be sure these items are switched out and washed often. Do you have a question about hygiene? Let us know in the comments section. When you think of pH levels, the first thing that comes to mind probably isn’t skin care. In fact, you’ve probably come across the term “pH” before without ever really understanding what these levels mean in relation to your skin. Without getting too scientific, pH levels measure how acidic or alkalinic a substance is. All of your skin care products have unique pH levels, and these don’t always match your skin’s pH level. In this blog post, Joel Schlessinger MD explains what you need to know when it comes to the pH level of your skin care products. Skin has a natural pH level that is slightly acidic, Joel Schlessinger MD explains. The pH scale ranges from 0 (very acidic) to 14 (very alkalinic). Although pH levels differ from person to person, skin pH is generally at 5.5 or slightly lower. pH levels also vary from body part to body part and they can change by the minute. A wide range of pH levels can actually be beneficial for skin. While some soaps are more alkalinic, Joel Schlessinger MD says this doesn’t mean they are less harsh. He also points out that products on the acidic side can actually help to cleanse more effectively. LovelySkin Luxe Gentle Cream Cleanser, for example, has a pH of 6.7, which is close to neutral. On the other hand, LovelySkin Luxe Clarifying Gel Cleanser has a slightly more acidic pH of 5.84 because it contains 2% glycolic acid and 2% salicylic acid to better exfoliate skin. Both formulas are great cleansers, but this is a perfect example of how acidity can affect cleansing properties. While the Gentle Cream Cleanser gently removes makeup and soothes the complexion, the Clarifying Gel Cleanser exfoliates without causing irritation or inflammation. Joel Schlessinger MD suggests trying products to see what works with your skin. While testing the pH level of all your products might sound like fun, it’s not necessary. Joel Schlessinger MD says the best way to find the right skin care products for your complexion is to try them. If you’re curious about a product’s pH level, there is an easy way to test it. Do you have a question about pH levels for Joel Schlessinger MD? Share with us in the comments.